Or more accurately, a small flock of mourning doves. These photographs are from a couple of days ago and they were made while looking out through the dirty windows so they are not very sharp. Two of the doves were sitting at the foot of our back door pressing their beaks up against the glass, cocking their little heads and peering in. I wonder what they were thinking? : ) Perhaps they were eyeing the pot of herbs just inside the door. The deep cold from several days ago has dissipated. It rarely stays that cold for too long here, although, it is sure to return. In the past few days we’ve had a lot of snow, a bit of rain, and now you can hear the gentle sound of tiny ice pellets falling on the deep snow. The weather is sure fidgety around here. Wishing each and every one of you, peace and doves. They do look sweet all puffed up in the cold. Thank you, Kerlund. I’m glad you enjoy these. “Peace and doves” to you too, my dear Karen!!! What a wonderful way to wish… Thank you!!! Merry Christmas to you too, Marina! : ) I hope you have a lovely holiday season. These are beautiful, Karen. I think this is the first time I’ve seen Turtle doves. They are lovely birds, aren’t they. Thanks, Karen. I’ve seen Doves here but they don’t have the Mourning Doves coloration. They’re very puffed up in this photograph..assumably for the colder weather. Amazing! Very very special and so beautiful. It was kind of special to have them peering in the door. So cute! Thanks for your always lovely comments and support, Gro. Thank you, Diana. Merry Christmas to you also. 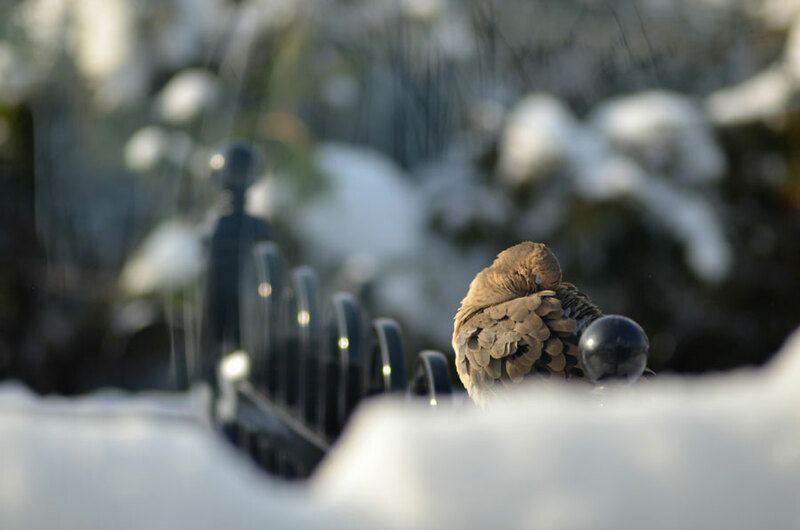 Beautiful little birds … lovely snow. Happy Christmas Karen, and wishes for an excellent 2014 too! Joy to the World with these images…beautiful subjects, beautifully captured, such a delight! I’ll bet that’s true. Good energy all round. Your visitors finding you and you finding them. Such wonder. And wonderfulness. Sorry to overdo my share of text-space but I would be remiss if I didn’t mention the absolutely gorgeous and skilled photography!!! Don’t ask for whom the dove toils . . . it toils for herbs. Thanks for the wishes, and likewise . . . unless you’re hungry, in which case I wish pieces of doves. Beautiful post! I wish you a peaceful and joyful Christmas. They are amazingly sweet Karen ! I especially love second photo. — So, piece of doves ! beautiful. now you just need to find some geese a laying and a partridge in a pear tree! lovely doves! Beautiful portraits, so intimate….I know their feathers well. Happens when there are neighborhood cats around and I find the feathers scattered under the rosemary. I don’t think I’ve ever seen them featured so beautifully, Karen. Wonderful….! Oh, beautiful! I love mourning doves! Best wishes to you, this holiday season! Beautiful images. Merry Christmas. Have a safe and happy holidays. rose et l’hiver d’ors blancs , la neige ses jours un mythe. How beautiful those doves are (and what gorgeous light). Our spotted Turtle Doves in Australia are about the closed to these. Aw, they’re lovely. Peace and doves to you too, Karen. Have a great break and a wonderful new year! Thanks for the doves, thanks for the peace. I wish you happiness and peace as well, we rather have pigeons here, not the best as a peace symbol. I love that third image, Karen…a sweetness there. I, too, thank you for the peace and the doves…wishing you the same happiness for the season…. ….and a 2.8 lens under my treeeeeee. LOL. Joking aside, those are wonderful shots. I’ve never seen a turtle dove actually. Merry Christmas! Beautifully composed photos. 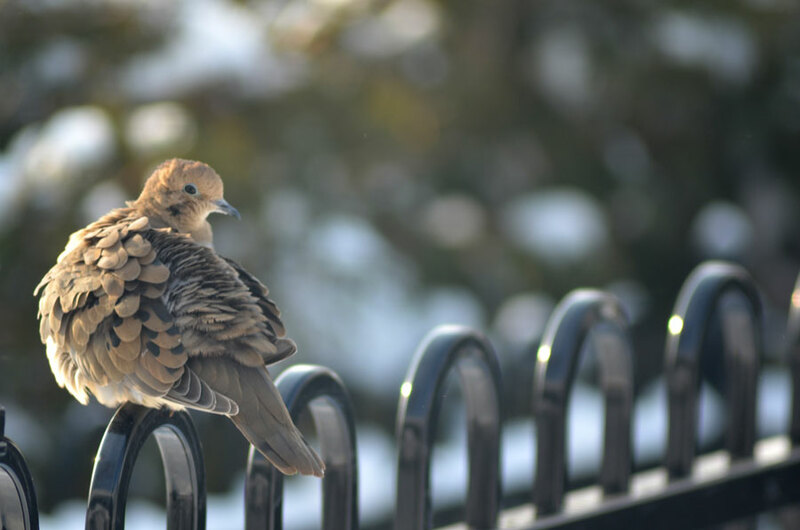 The colours, together with the contrast between the fluffy feathers and the rigid iron fence, combine to complete very effective pictures. What pretty little creatures they are. I love that second image. Here in Sydney it has been stinking hot and humid but today it’s cooler. Hooray! A very happy Christmas to you and yours, Karen. Flawless and artistic composition. Peace and many lovely doves Karen! What a beautiful sight, Karen! Wishing you a beautiful Xmas and all the best for the upcoming new year. As always, a pleasure to follow your blog!! Gee Karen, your windows are a LOT cleaner than mine! Keep warm and have a wonderful holiday! Beautiful light on the birds! 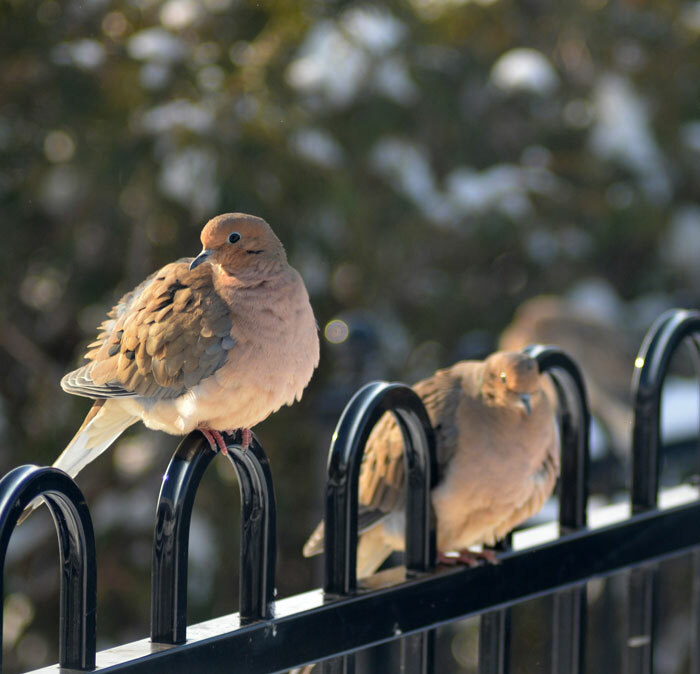 I love mourning doves and you captured them beautifully ! Too beautiful. 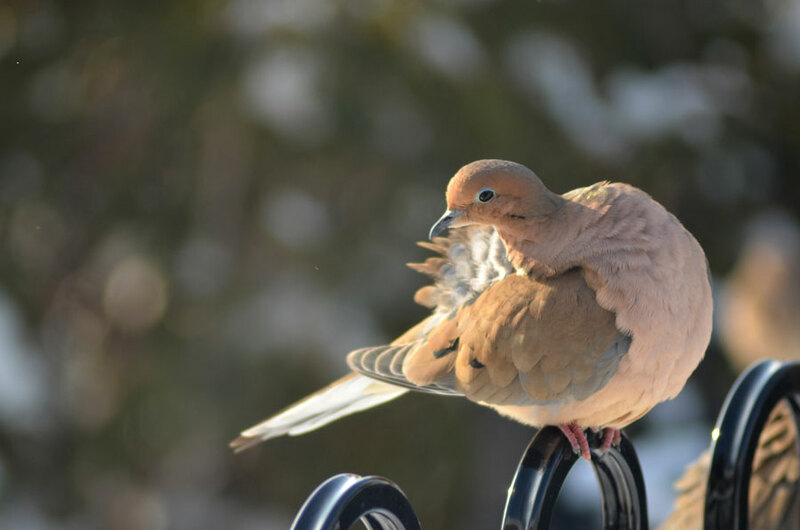 Mourning doves are the most delightful creatures. OOooo I love to listen to them. 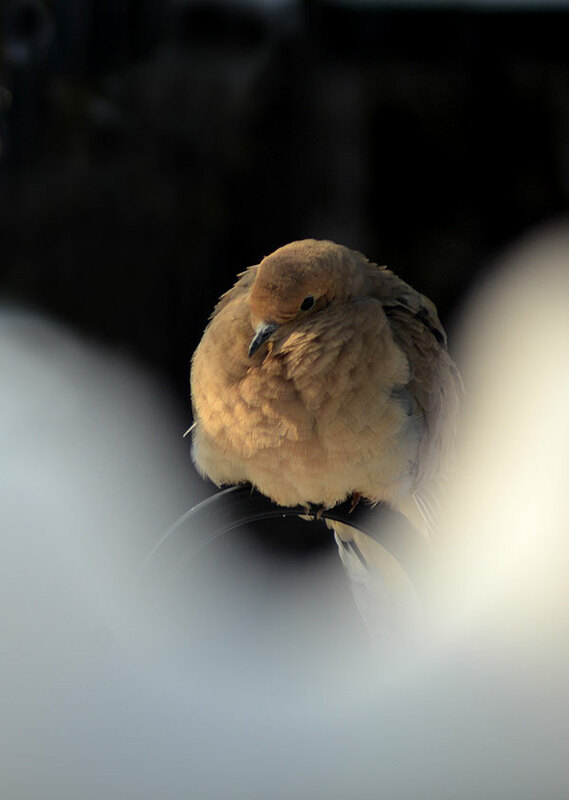 I miss seeing mourning doves. You have captured their serenity and sweetness. I love the last two- what great captures!